Genre. Its a word that we as fans often find it hard to escape. Divisions, subdivisions, blended tropes and multi-faceted narratives all contribute to this idea that we can always find a place, no matter how small or esoteric, to classify the media we consume. Because no matter what the property, there will always be some kind of genre to place it is, based on whatever we as fans hold sacred. Take Alien, for example. When I reviewed the movie earlier this month, I bounced around between calling it science fiction and horror, because the film contains many elements from both genres. It was born out of a screenplay for an SF “comedy,” borrowed elements from Jodorowsky’s epic failed Dune adaptation, and borrowed liberally from every SF trope found at the time. But it also dealt with burning tension, jump scares, blood, and the type of monster that came from our nightmares, and acted like a stereotypical slasher villain. Discussions about the movie occasionally asked questions about where it belonged, until the blended genre of SF-horror became more widely accepted, and it found a niche that satisfied both genre fans (or neither, if one is so puritanical about labels). So how do we as fans assign genre? What do we look for when classifying a property, and how do we alter and adapt our definitions to make wayward media fit? That in itself is a huge question, one that I am ultimately unable to answer, or even begin to explain. Better scholars are tackling the subject, and I eagerly await their findings. Rather than try to go down that route, I want to brooch the subject right here with a film that I watched last week, which defies a lot of genre markers, namely because it has so many to choose from. Director, cinematic activity, music, and setting all play a role in where this film can be placed in the “genre-line,” and at least for me, the film belongs to them all. From the moment the opening credits end, Assault on Precinct 13 does its best to remain ambiguous about what type of film it is. We know that it was written and directed by horror giant John Carpenter (who also supplied music), but it opens on a track reminiscent of the gritty police procedural that dotted the 70s television landscape. Viewers who have only seen the 2005 remake, might be taken aback by those early moments, particularly how the film slowly sets its players up in preparation for the violent climax. The reboot was firmly an action film, and portrayed itself as such, with wild gun battles and the type of tension that is evidenced from gunfire and impossible stunt work. This is how we in the 21st century tend to approach police and military films, and some of the “procedural” series that appear on television. We go into the film expecting some sort of genre conforming, and are prepared for firefights and action. The 1976 original film sets itself apart from those genre specifics by being precisely the opposite: it moves slow, and feels very real from the moment it begins. We are given hints of the same foreshadowing that Carpenter seems to love. From a bizarre, almost occult bloodletting ritual performed by gangbangers, to the behaviors of the mobsters being transported, the film toes a line between horror and crime drama, diving into neither, but content to sit on the boundary and challenge what we think we know about both genres. And then the action begins. Or perhaps more appropriately, the violence begins. In perhaps the most shocking way possible- with the murder of a young girl eating ice cream. The look on her face as the hollow-eyed gangbanger shoots her, the way she falls, the helplessness on her father’s face and in the eyes of another victim gunned down in the same incident, all have a home in the crime genre, but in that moment of violation, when the tropes of 70s Americana are shot down in one second of screen time, the horror sets in. Carpenter is a master of challenging perceptions of American life. He is unafraid to depict suburban violence as it is, often to the chagrin- and horror- of moviegoers. He succeeds in dragging the horror out of the mundane. And from the moment the shot is sounded, Carpenter infuses these horrifying sensibilities into his crime film, transforming and blurring the lines between procedural and horror film. Established genre is challenged, and the audience now gets to see the results unfold. 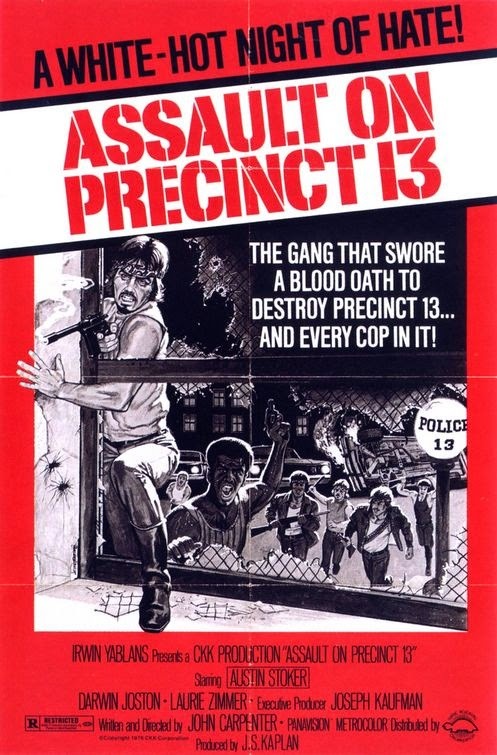 Assault on Precinct 13 was deemed exploitative at the time it was released, itself a sort of genre dating back to the pulp era. “Horror” up until the 60s and 70s, typically represented by the Hammer films, was usually of the supernatural kind, with little actual violence and an emphasis on the otherworldly. Carpenter was one of the directors who changed that, by depicting stark violence and degraded morality in place of demonic influences or ghostly possession. His films (and those of Craven, Hooper, Cronenberg, et al) marked a definite shift in the definition of horror as a genre, and what could be contained under the umbrella. It also influenced subsequent films, which would blend the violence with older ideas of the supernatural, and bring about the classic films of the 80s and 90s. But at the time of release, genres like “thriller,” “killer,” or “exploitation” would all have been used instead. While I watched Assault unfold in its tense, dramatic fashion, I wondered aloud if the only reason this film could be labeled “horror” is because of the director and his ties to the genre over the years. Very little about the film struck me as belonging to the horror genre, rather a police movie with a greater than average amount of violence, and a flood of gangbangers that took cues from the “horde” idea popularized by Romero in Night of the Living Dead. A quick Google search echoed these questions, as the film still resists a genre classification today, due to its reliance on a multitude of tropes and elements that cross over from horror to action, and back again. Speaking of Romero’s influences, the villains in the movie themselves are a mix of ideas taken from both old and new horror. They are shown as a large, and ultraviolent, street gang, concerned with only two ideas: violence and revenge. They shoot people without provocation, and deliver retribution down upon the poor grieving parent who strikes back at them, using their size as an exhibition of power, like the gigantic horde of bullies that they are. They are largely faceless, dressed in their “uniform” and attacking en masse, breeching through holes and windows, shooting indiscriminately, and dying without a sound, content to throw themselves bodily into harm for the sole sake of enacting revenge. Their emotionless actions (and method of attack) harken back to the zombies that terrorized survivors in a farmhouse maybe a decade earlier, when Romero inadvertently invented the modern zombie movie while trying to tell a story of survival. Now look at Assault again: a giant, faceless, massive horde that defies logic and basic instincts for individual survival, throwing itself at a small cluster of survivors and attempting to devour them in a wave of bullets and blood. Little care for personal safety, only the maximized potential for death. A classic “horde” attack, with precious few to fend it off. At at the point of climax, these supposedly thinking humans form up as a giant wave, eschewing any thought of strategy in favor of all out numerical assault, and death by conflagration- the same death that countless zombie films employ as a storytelling element. Does this mean, then, that on some level, Assault on Precinct 13 is a zombie movie? Well, that depends on how a fan might approach the label of zombie, and how they choose to interpret the faceless enemy in the movie. Elements of zombie films are in place, and the behavior of the gang mimics it in many cases, but the puritan fan would likely chafe at the suggestion, while the liberal fan would take a pause, maybe nod, and go on with enjoying the end result. Genre fluidity at its best. Assault on Precinct 13 is a horror movie in the same sense as all those early serial killer and slasher films are horror movies. Its director, reliance on violence and shock value, and the notion of a genre in flux all allow for its easy classification into a genre that was evolving and changing its own definition in the 1970s. It is a horror movie that retains the sensibilities of older action and suspense genres, but pushes the envelope in ways that audiences at the time were unprepared for. It borrows liberally from experience, news, tropes, and ideas that are frequently shared between directors looking to create something meaningful, or shocking. But its also horrifying because it is real, and because it can send shivers down your spine.